All Asanka knows is poetry. From his humble village beginnings in the great island kingdom of Lanka, he has risen to the prestigious position of court poet and now delights in his life of ease: composing romantic verses for love-struck courtiers, enjoying the confidence of his king and covertly teaching Sarasi, a beautiful and beguiling palace maid, the secrets of his art. But when Kalinga Magha, a ruthless prince with a formidable army, arrives upon Lanka's shores, Asanka's world is changed beyond imagining. Violent, hubristic and unpredictable, Magha usurps the throne, laying waste to all who stand in his way. Under his terrifying rule, nothing in the city is left untouched and, like many of his fellow citizens, Asanka retreats into the shadows, hoping to pass unnoticed by the tyrant. But it seems his new master is a lover of poetry... To Asanka's horror, Magha tasks him with the translation of an epic Sanskrit poem, a tale of Gods and nobles, love and revenge, which the king believes will have a civilising effect on his subjects, soothing their discontent and snuffing out the fires of rebellion he suspects are igniting across the island. Asanka has always believed that poetry makes nothing happen, but as each new chapter he writes is disseminated through the land and lines on the page become cries in the street, his belief and his loyalties are challenged. And, as Magha circles ever closer to the things Asanka treasures most, the poet will discover that true power lies not at the point of a sword, but in the tip of a pen. 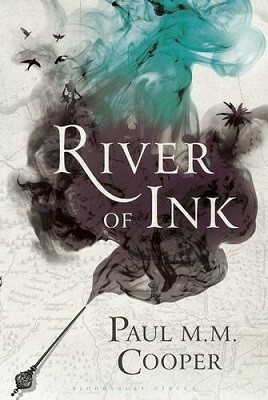 ‘River of Ink’ is without a doubt one of the cleverest books I have ever read. Not in a showy or flashy way, but through its simplicity which speaks volumes. I have read a number of books based in Ceylon, though this one is set much further back in history, to a simpler time. Simpler village life, yes, but a time of kings and conquerors and epic poetry.